Context is very important with this album. 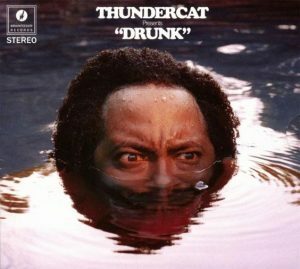 If you don’t know who Thundercat is or what his music is like, then you’re in for a (probably unpleasant) surprise. Drunk is a weird mix of social commentary and exploration into his emotions. Some songs are meant to hit home closer than others, like the track “Jameel’s Space Ride” that explores the tale of a young black man wanting to escape life by riding into space to escape the everyday trials that come with being black. Other tracks are set up to be as weird as possible, like the track Tokyo, a ballad of how his love for anime ruined his life. All of these tracks, of course, are set on top of some sweet R&B and jazz fusion instrumental that make it a good album to mellow out to. Drunk is definitely worth a listen, but do some research before hand.